You can make a one off donation to the Irish Horse Welfare Trust by credit card or PayPal. The money that is donated to our Charity will go towards caring for rescues like Tess, who was rescued in April 2014 after being found abandoned on land in Wicklow. Tess came into our Equine Centre in a severely emaciated condition. Unfortunately she was so weak that after 2 weeks of care we had to make the decision to have her humanely put to sleep. 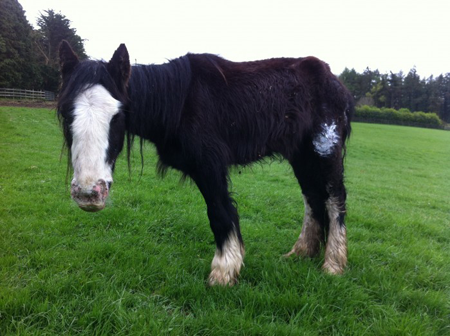 There are many more horses like Tess who urgently need our help & care. You can safely and securely make a one off donation of any amount you can afford, though our payment provider paypal. If you don’t have a paypal account, no problem – you can donate by credit card. Our work is ongoing and regular contributions help us to continue to care for horses in need. You can safely and securely set up a regular donation with our payment provider paypal and you don’t even need a paypal account! On behalf of all the horses, THANK YOU!